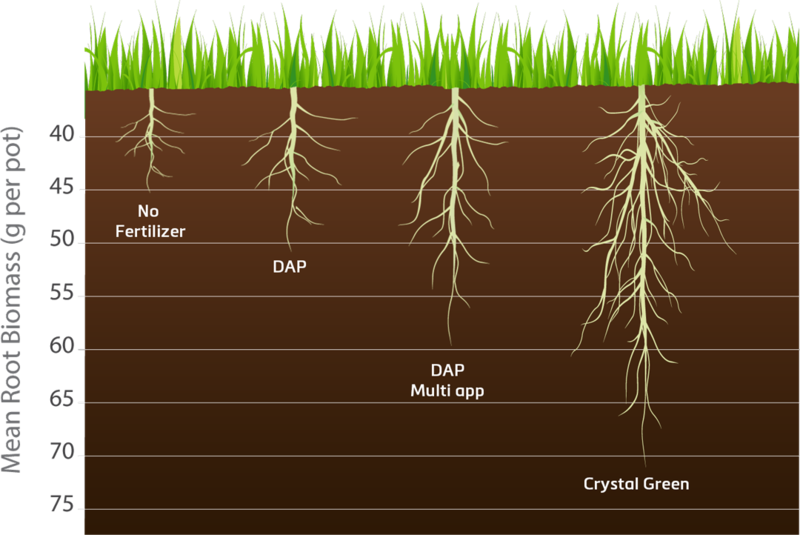 Crystal Green®’s Root-Activated™ nutrient technology releases nutrients gradually, feeding turf according to root demand. When soil isn’t providing enough phosphorus, roots have a difficult time establishing and turf can lose vibrancy and struggle to recover from stress and disease. Crystal Green helps overcome and avoid these conditions by providing a season-long supply of Root Activated™ continuous release phosphorus, along with nitrogen and magnesium, that builds denser root mass for improved wear and stress tolerance, while also lowering the risk of phosphorus leaching and runoff. Auburn University Turf Grass Professor, Beth Guertal, discusses her current research study comparing the application of conventional phosphorus fertilizers and the application of Crystal Green on Bermuda grass. Preliminary findings show when phosphorus source is Crystal Green, there is a significant difference in P-retention in soil, suggesting reduced leaching with Crystal Green. Brian McManus of Quest Landscapes, Isle of Man, needed some help with a turf field reseed, and turned to Mike Atherton of Isle of Man Farmers. The challenges growers face in every area of the UK to produce optimum turf are varied but the Isle of Man has its own unique set as Quest Landscapes discovered when reseeding an area being grown for turf. The island has very heavy rainfall (1200mm) and acidic soils but this reseed also showed severe phosphate deficiency. With the help of a complete diagnostic recourse and input from Isle of Man Farmers, Quest Landscapes was able to completely transform the sward shown below, restoring health and vigor to the turf. The key to the successful transformation was to ensure complete availability of any applied phosphate, which would typically be problematic with a soil pH of 4.6. Given its unique mode of action, Crystal Green experiences minimized phosphorus tie-up and, as such, was identified as the main component of the proposed restorative action. Crystal Green is a recycled phosphate fertilizer that is citrate soluble and provides a season long continuous release of phosphorus, nitrogen, and magnesium. "Given its unique mode of action, Crystal Green minimized phosphorus tie-up in a highly acidic soil which was the main component in the successful restoration of the turf"